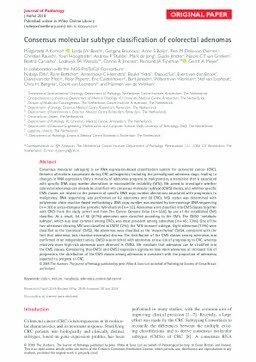 Consensus molecular subtyping is an RNA expression-based classification system for colorectal cancer (CRC). Genomic alterations accumulate during CRC pathogenesis, including the premalignant adenoma stage, leading to changes in RNA expression. Only a minority of adenomas progress to malignancies, a transition that is associated with specific DNA copy number aberrations or microsatellite instability (MSI). We aimed to investigate whether colorectal adenomas can already be stratified into consensus molecular subtype (CMS) classes, and whether specific CMS classes are related to the presence of specific DNA copy number aberrations associated with progression to malignancy. RNA sequencing was performed on 62 adenomas and 59 CRCs. MSI status was determined with polymerase chain reaction-based methodology. DNA copy number was assessed by low-coverage DNA sequencing (n = 30) or array-comparative genomic hybridisation (n = 32). Adenomas were classified into CMS classes together with CRCs from the study cohort and from The Cancer Genome Atlas (n = 556), by use of the established CMS classifier. As a result, 54 of 62 (87%) adenomas were classified according to the CMS. The CMS3 ‘metabolic subtype’, which was least common among CRCs, was most prevalent among adenomas (n = 45; 73%). One of the two adenomas showing MSI was classified as CMS1 (2%), the ‘MSI immune’ subtype. Eight adenomas (13%) were classified as the ‘canonical’ CMS2. No adenomas were classified as the ‘mesenchymal’ CMS4, consistent with the fact that adenomas lack invasion-associated stroma. The distribution of the CMS classes among adenomas was confirmed in an independent series. CMS3 was enriched with adenomas at low risk of progressing to CRC, whereas relatively more high-risk adenomas were observed in CMS2. We conclude that adenomas can be stratified into the CMS classes. Considering that CMS1 and CMS2 expression signatures may mark adenomas at increased risk of progression, the distribution of the CMS classes among adenomas is consistent with the proportion of adenomas expected to progress to CRC.